Why Should You Read or Offer This Book As A Gift? This impressive book forces us all to rethink the role of intelligence in organizations. It is an essential encyclopedia of knowledge about why intelligence gathering is vital for businesses and it also shows how it can be carried out successfully. President, Equity Resources Group Inc.
In Harnessing the Power of Intelligence, Counterintelligence & Surprise Events, Alan Martin first takes the reader through the active and defensive essentials of CI, from both the process and the management perspectives. While basic, these chapters are an interesting read, particularly since he uses a number of real-world examples that are new, at least to me. Harnessing the Power is a novel work. The core of that effort, Chapter seven Value incubation: a proven framework for early detection of threats and opportunities is a real gem. It walks the reader through one model of how individuals convert raw data into useable intelligence. As you read through it, Alan links his vision of analytical phases with real world examples of successes and failures, based on such principles. He then moves on to the use of the CI you have generated. Finally, Alan has three chapters to help the CI professional understand those with whom the CI professional must deal with, in his or her own organization. I found, as I read these closing pages, that many of the tools and techniques he was using could well be applied to profiling competitors key executives, or defining a competitors corporate culture and view of the world. What is called intelligence in Alain Paul Martins book may be thought of by others as gathering appropriate information for which organization leaders should position their organizations to successful capitalize upon. This is the message that senior leaders--in DOD or outside of DOD--should take away. Intelligence, from my viewpoint, is only a subset of information and the concepts described in the book really provide a useful framework to grapple with this larger problem. As usual, in one pithy phrase, the management sage Peter Drucker captures the central problem facing organizations in an uncertain environment -- they are looking in the wrong place. This sin has an even greater cost when things are volatile -- as they are today. The natural human tendency in rocky times is to pull in antennae, and hunker down in the cocoon of the controllable. However, the effective leader understands that volatility is an opportunity for achieving greatness because the prepared organization can jump ahead of its ostrich-like competition. Yet, there is little business management advice on how to combat these natural human tendencies and systematically scan, analyze and act on the uncertain environment. Michael Porter, in his classic works Competitive Strategy and Competitive Advantage did dole out useful advice on how to gather competitive intelligence, but he did not opine on how leaders can systematically take action to turn intelligence into commercial advantage. 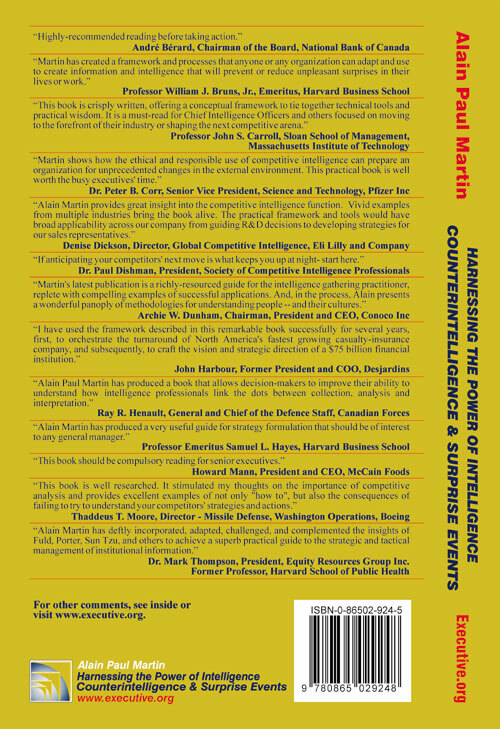 Alain Martins new book Harnessing the Power of Intelligence is a compendium of practical advice and well tested management processes that facilitate this transformation from intelligence to value. Martins competitive intelligence framework is based on research on a number of companies including American Express, Boeing, Dell, DuPont, GlaxoSmithKline, and Microsoft. Within the framework are a number of core tools that the author has applied in businesses, government entities and the military. In my judgment, there are three key items. First, the book has the most up to date and complete list of intelligence sources. For example, Martin cites the University of California at Berkeley "Invisible Web" project, which has shown that search engines only document about 15% of publicly available business intelligence, because the vast majority of it is, either not in a standard hypertext format, or not linked to a public domain name (the so-called silent campers). Second, his framework on issue incubation shows that large scale issues go through a relatively predictable process of evolution and development. Many leaders make the mistake of getting on an issue too early or too late. The issue incubation process delineates ways to recognize the progression of topics, and provides advice on if, when and how to intervene. Third, Martin has a tool called Factional Analysis Grid that helps a manager analyze who is likely to influence a volatile situation (from allies to adversaries). This tool is much richer than the traditional stakeholder analysis for it includes roles that do not fit in the normal economic calculus. For example, he includes "fanatics" in the analysis -- people whose sole purpose is to disrupt. A leader can take the advice in this book and use it to guide outward looking intelligence, assess the current state of issues (or do a triage on a surprise event), and then take concerted action. At points, the book does suffer from the same weakness of Porters books in that in its desire for completeness the text often has a "list-like" feel. But, on balance this book provides a framework full of tested tools to turn uncertainty into value. * Dr. John J. Sviokla is a principal and US Advisory Innovation Leader with PwC. He also serves on PwCs Advisory Leadership Group, the Global Thought Leadership Council, and leads The Exchange, an ongoing think tank for PwC clients and world class business leaders. Previously, he served as Vice Chairman of the Board and Chief Innovation Officer at Diamond Management Consultants. He has created some of the very first thought leadership pieces on the coming world of digital competition including, Managing in the Marketspace, Harvard Business Review 1994, and Exploiting the Virtual Value Chain, Harvard Business Review 1995. Dr. Sviokla is a frequent speaker on topics of innovation, growth, and emerging customer behavior. He is also a major contributor to Oxford Economics study on Digital Megatrends 2015. Dr. Sviokla earned his Bachelors degree from Harvard College and obtained his Masters and Doctorate degree from Harvard Business School. He served on the Harvard Business School faculty from 1986-1998. With our attention focused on post September 11 terrorist threats, an explosive Middle East situation and the demands of the ever-expanding knowledge economy, a new book offers a refreshing and practical perspective on dealing with intelligence. 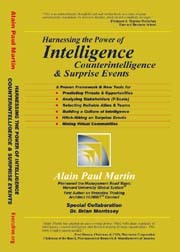 Alain Paul Martins Harnessing the Power of Intelligence, Counterintelligence & Surprise Events is a distillation of years of experience of working with corporate strategy, intelligence and counterintelligence. Martin, who provides strategic consultancy to major international clients, gives us powerful tools to better use intelligence at the national and corporate level. For instance, his value incubation framework allows the user to anticipate and see how the linkages between seemingly isolated events can often lead to major tidal waves. He demonstrates clearly with an analysis of major financial disasters including the $64 million American Express Soybean Oil scandal, geopolitical events like the fall of the Soviet Union, and health crises such as the breakout of BSE (or mad cow disease). The ability to recognize isolated events as signals of potential upheavals is a recurring theme. Martin also provides many examples of failure to act on valuable intelligence. Approximately half of the book is devoted to this issue with a wealth of factual case studies that give readers the inside story behind major events. Martin focuses on how intelligence can help an organizations staff make wiser choices, become well informed and be better prepared. His competitive intelligence framework uses examples from American Express, Boeing, Dell, DuPont, GE, GlaxoSmithKline, IBM, Kellogg and Microsoft, among others. By considering real business and government situations, the book brings the framework alive and shows how it can be applied to win customers and allies, seize opportunities, anticipate threats, shield intellectual assets from adversaries, and learn about the key players, all by legal and ethical means. For example, his Factional Analysis Grid provides a new way to analyze and categorize allies, foes, and political leaders. Consider the current German position on Iraq. As early as 1999, Martin warned his clients that Chancellor Gerhard Schroeder is a rider and hitch-hiker on foreign issues who can quickly shift his rhetoric to gain or maintain power. Moreover, the appendix on the BSE outbreak in Britain is written by Dr. Brian Morrissey, a leading authority on managing large-scale risks in health, food and agriculture. This rich case study, about a mismanaged high level of risk to a national population, will be of interest to anyone engaged in building public trust when managing high-profile issues. While the books style is uneven at times, the wealth of practical information it offers, including accessible resources, tools and references, cements its value. All in all, a most valuable and practical guide to an increasingly vital dimension of corporate and government survival. * André Potworowski is President of TMA-Technology Management Associates and Adjunct Professor in the Executive MBA program of the School of Management at the University of Ottawa. He consults to large R&D organizations on strategy and innovation. He was a Science Writer for the CBC. He holds a Ph.D. in Physical Chemistry and Computer Science from the University of Toronto, and an MBA from Harvard Business School.